As pilgrims from the Diocese of Erie made their way across Pennsylvania Monday, Sept. 21 to Philadelphia to attend the World Meeting of Families, they met a convoy of 14 Pennsylvania National Guard trucks stopped Monday afternoon in Valley Forge, just outside the city along the Pennsylvania Turnpike, also bound for Philadelphia. 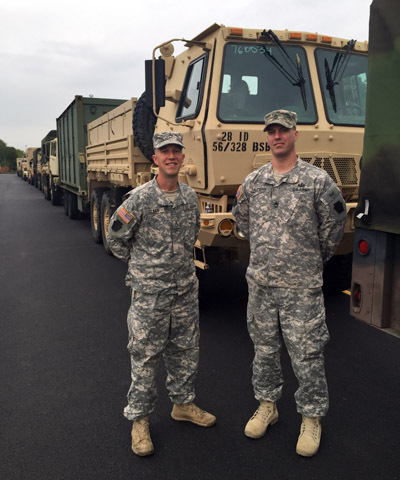 Members of the 56th Striker Brigade of the guard are part of an advance detail setting up camp outside of Philadelphia for this week’s World Meeting and events with Pope Francis. The unit will support Philadelphia Police with security as about 1 million people are expected to converge on the city. “I think it’ll be nice to get to see the pope, but it’s good just for me to be able to help everyone out,” said Staff Sgt. Christopher Claar.